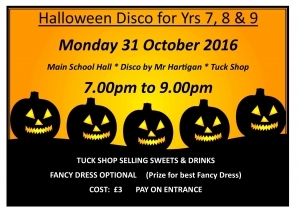 Halloween Disco for Years 7, 8 & 9 will take place in the school main hall on Monday 31 October 2016. That gives you half term to decide on the best scary outfit you can put together ready for the event. PRIZE FOR THE BEST FANCY DRESS!! 7pm to 9pm.